The White House strongly condemned the crackdown on anti-government protesters that left 28 people dead Friday, and says Syrian President Bashar al-Assad is leading his nation down a "dangerous path." Witnesses and activists say at least 10 deaths occurred in the northwestern province of Idlib. The military shelled targets in the provincial city of Maaret al-Numan. State-run news reports said an armed group had attacked security forces in the city and set several government buildings on fire. Meanwhile, Assad has been avoiding calls from U.N. Secretary General Ban Ki-moon. Ban tried to call the Syrian leader several times, but a U.N. spokesman said Assad would not come to the phone. Meanwhile, witnesses and activists say security forces used live ammunition to disperse anti-government protesters in several other cities. They say protesters were killed in Damascus and in the southern Daraa region. 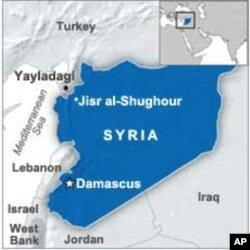 A separate military siege is unfolding in Jisr al-Shughour, a town in the northern region near the Turkish border. Military forces moved into the town after the government said "armed gangs" in the region had killed 120 security personnel. Residents of the town have been fleeing, many of them into neighboring Turkey. Turkish news reports said Friday the number of Syrians who had crossed the border had swelled to about 3,000. Diplomatic efforts to quiet Syria's unrest are unfolding on several fronts. United Nations diplomats held new talks on Friday on a draft resolution that calls on the Security Council to condemn the Syrian government's crackdown. Many Western nations back the measure but Russia and China have voiced opposition. Turkish Prime Minister Recep Tayyip Erdogan condemned the Syrian government for its crackdown on protests. The semi-official Anatolia news agency quotes him as calling the crackdown an "atrocity" and saying the Syrian government has not behaved "humanely." He added that Turkey is making plans for a refugee buffer zone on the border. Russian special envoy Mikhail Margelov said Friday that he planned to meet soon with representatives of Syria's opposition. Rights groups say at least 1,100 people have been killed in the Syrian crackdown that began in March and more than 10,000 people arrested.